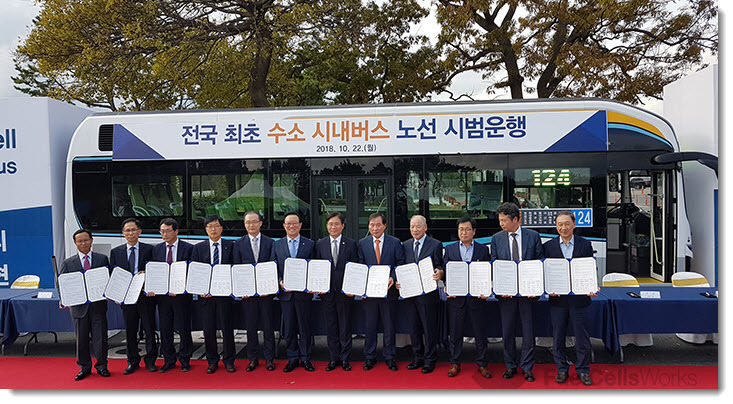 Ulsan City – Hyundai Motors held a ceremony in Ulsan today to launch Ulsan's' Hydrogen Electric Bus Demonstration Project, the project calls for a hydrogen electric bus to begin operating on the city bus line 124 from Ulsan Metropolitan City on the 22nd of October 2018. It is the first time in Korea that eco-friendly hydrogen electric buses capable of reducing emissions of pollutants and reducing fine dusts are used as typical buses for public transportation. The hydrogen electric bus, which runs on 124 buses in Ulsan Metropolitan City, runs twice a day for 56km round trip from Ulsan Public Bus Terminal to Daeangam Park. The route is currently underway for 11 CNG (compressed natural gas ) buses. The bus was originally introduced as a third-generation hydrogen electric bus from Hyundai Motor Company in February 2018 as a vehicle sponsored by the 2018 Pyeongchang Winter Olympic Games and the Winter Paralympics. In addition, Hyundai, and nine hydrogen industry-related companies and South Korea Hydrogen Association, Ulsan Metropolitan City signed an additional multilateral work agreement (MOU). These companies, associations and municipalities in the hydrogen industry will support a full-time hydrogen industry, which includes hydrogen production, supply and utilization. It will also expand the supply of hydrogen electric vehicles and hydrogen electric buses as well as expanding hydrogen electric trucks and hydrogen electric forklifts. Finally, the companies will cooperate with aim of constructing a production system of 30,000 hydrogen-electric cars annually. If the 30,000 number is realized, it may mean job creation in related fields of up to 2,200 new jobs for this part of Korea. Hyundai Motors will begin mass production of next-generation hydrogen electric buses that will upgrade the performance of its vehicles, including stack durability, Hyundai plans to apply the world's best fuel cell efficiency and motor output to the next-generation hydrogen electric bus, and focuses its research and development (R & D) capabilities to dramatically increase the single-charge mileage.